Latest proposals will leave many cold and out of pocket. they arent. thjey are looking at making solid fuel burners cleaner. Yet more planet fear; unenforceable. No worries here. There will be no legislation making anyone change existing fires. Those existing fires will become cleaner by burning cleaner fuel. The cleaner fuel like kiln dried wood burn more efficiently thus providing better heat. I don't see a problem with his at all. It's quite easy to self-check moisture content of logs, which should be below 20%, by using a simple moisture meter. That’s good. My solid fuel stove is 40 plus years old and looks like it has many more years to go. Always burned smokeless fuel in it. Have another one I use occasionally where I burn logs I have cut down, which apparently are the Satan of solid fuels. Must admit I didn’t think it was a problem but always interested in people’s different perspectives. So thought I’d ask the question. Once again more tosh coming out of politicians mouths who don’t listen or understand. 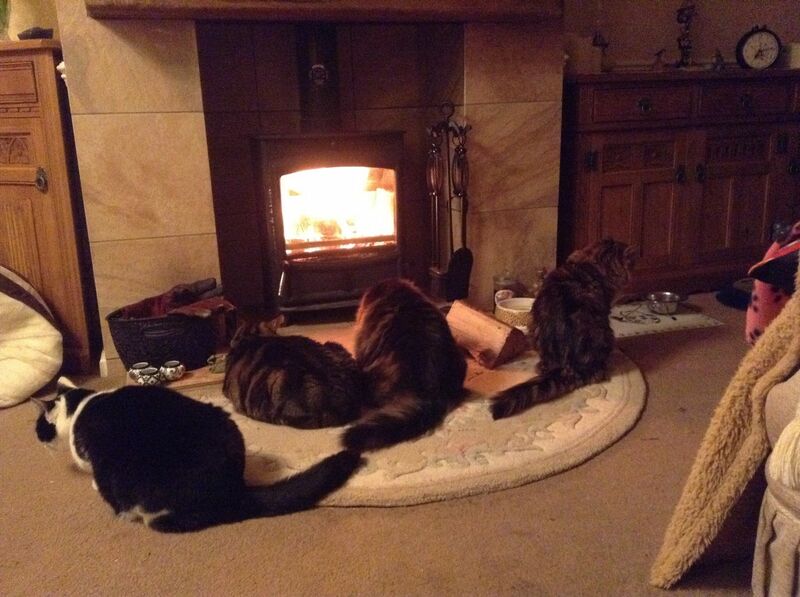 Cats love open fires needs a petition to bring back open fires for all the cats and to warm your hands and make toast on a red fire nothing like it. This is definitely more of a problem for towns and cities than for rural areas. In built up areas where electricity and gas are taken for granted, solid fuel and log burning stoves are a fashion accessory and probably a nuisance where inappropriate fuel is burned by ill-informed city dwellers. But in rural areas which make up most of the land in the UK and where there is no mains gas, log burners become more important. I suggest that they will need to guarantee my overhead electricity supply in all weathers, storms, blizzards and floods included, before they start to complain about the log burner which is our ONLY form of heat in a power cut. Our oil heating depends on the electric pump and electronic controls so it's no good in a power cut. I've considered getting a genny but hooking it up to the house seems complicated! In fairness we don't get that many power cuts but they always happen in extreme weather when we need some form of independent heating hence the log burner..... We haven't used it much this year as its been too warm! They need to focus on banning all those external heaters that are used outside bars and restaurants as well as on people's patios. They are extremely wasteful! If you find it too cold to sit outside then simply don't.